This is a guest post written by Arun Garg, who loves to write about SEO, blogging and gadgets at Arunii. You can read more on him at about section. Some SEO & blogging topics always catch your attention viz – link building, earning money online, inspirational blogger stories, etc. Dofollow links is also one of the hottest topic which always attracts my attention. Many high page rank (PR) & authority sites have enabled dofollow links either in the comments section or in the top commentators widget placed in the sidebar; and some sites reward their valuable commentators at both places. These sites get returning visitors and traffic by implementing this idea. Read another post on leaving a good & lasting impact through blog commenting. Now the question comes is, do these commentators get some benefit in terms of page rank by leaving fresh, lengthy & meaningful comments ? Is it mere waste of time & effort ? When Google’s last page rank update happened I noted that some sites take proper advantage of these do follow links on offer. Brief Analysis – I observed that links from the top commentators plugin (widget) are more effective because these links will remain in the whole site whereas a link from the comment section will be restricted to that single post. Best for new blogs to get noticed and to gain quick authority in search engines‘ eyes, it will be an added advantage if your blog is related to technology or blogging niche-wise. It also helps in building relationship with other bloggers. Some bloggers announce the top commentator of the month award and provide a dofollow link or banner for the following month. Top commentators Links in sidebar are temporary and will remain as long as you keep commenting & stay well ahead of others, hence requires a lot of your attention. Hiring a link builder just for this task can be a good option. Links in the comments section pass very little page rank and Google treats the bottom links differently as compared to top post links. Watch this video by Matt Cutts. I have seen many bloggers and webmaster who changed their do follow links to no follow; so your hard work goes in vain. So what’s the conclusion ? So it may be a nice idea to get some quick page rank specially for those who do not want to try guest posting or any other authority link building method. Go for it but side by side also build some permanent links. While leaving a comment on a CommentLuv enabled blog is good, I really don’t put too much stock in whether my comment becomes dofollow or nofollow. I leave comments because I like what I read and wanted to provide my thoughts and opinions. What are the other ways to get permanent dofollow links ??? Interesting, it seems that the footer links are holding less value these days and links within articles and paragraph is where the real value is. This is good new for the blog engage feature spotlights as all our customer links are in the paragraph of the content it self. Yes, that’s why guest blogging ad submitting your articles becomes so popular. By=ut nevertheless commenting still may bring you some link juice. If done properly It can be productive but it isn’t an easy task. Nice post Aruni. Very informative. I think guest blogging is the most effect form of link building to drive in quality links to our sites. Blog commenting is more of a form of involvement in others’ blogs which helps us in creating a good rapport with other bloggers in our niche. Same with forums. Thanks for expmlaining in details the advantage and disadvantages of do follow links. Excelent post indeed. I think that commenting on dofollow blogs is always good and beneficial! So, I mostly prefer to comment on dofollow blogs and even with keywordluv enabled blogs! I would say using some nofollow links in your link building would make overall links natural to the site. Nice one.. usually i used to spend most of my time on commenting, while i have stopped the commenting part but surely looking forward to start again..
Great post! I was just searching on this topic for a while! I do not think there is a real downside to commenting on do follow blogs at all. Not only is it good for SEO but I have noticed that do follow bloggers tend to stick together so it is good for networking with like minded bloggers as well. For me, if I feel compelled to comment I do regardless of it it will be do follow or not. Blog commenting is not only a link building strategy but also a branding strategy. Leaving a thoughtful comment that contributes to the conversation will get you noticed. It’s also a way to start a dialogue and relationship with other bloggers that may lead to additional opportunities. I personally leave a comment when I read the whole (or most of) the post and liked it, if not I don’t. It doesn’t matter to me if it’s dofollow or not. Like most have stated I normally don’t care weather it is follow or not, if I like it and can add something valuable to the conversation then I do. 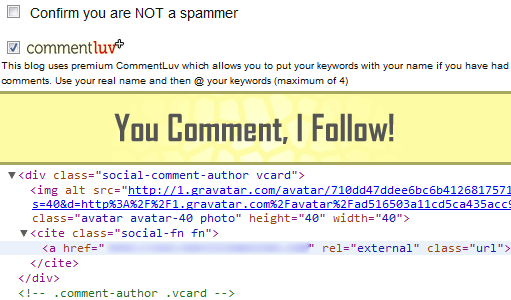 Really great article if someone go for link building via Do follow commenting. I like your whole post Advantage and Disadvantage of Commenting on Do follow blog. Great post, which widget or plugin do you recommend that has dofollow option. I don’t understand why people would change their blog to no follow. I like to comment when I’m inspired and don’t check for the follow/no follow; but the link back (even though small Google juice wise) is a nice perk. I think there are other benefits other than SEO. We can learn a lot by reading the perspective of others. Others will find your blog and hence your perspective from the links left on other’s blogs too – at least that’s my impression. I think real people coming to the blog equates to more traffic and exposure. So there are real benefits aside from SEO. you make some great points.about this. I think the advantages far outweigh the disadvantages and make dofollow commenting well worth your while, given that you take the time to write an intelligent comment that will add value to the community. This speak to your point about relationships. Great points, and as mentioned above commenting deom real people regardeless of no or do follow is to be encouraged. The small level of spam gained from a do follow can be easily deleted, and then the real followers do get some reward for commenting and keeping a blog alive! The majority of my blog commenting comes from searching information I require myself, if the post was useful then often I leave a comment to show my appreciation. Obviously this also provides me with the opportunity to leave a link back to my own interests. I have read that google would interpret a website with only do follow links as unnaturally backlinked – as such I target a mix of do follow and no follow links. e.g. only occasionally sourcing do follow blogs solely, but I guess in the scheme of things this makes me more likely to visit a do follow blog and hence it a worthwhile strategy. Excellent article. One of the biggest advantages of blog commenting on do follow links is that blog commenting helps to build relationship with other bloggers & disadvantages is that some web programmers changed their do follow links to no follow, so your hard work goes in loss. Thanks to share this great information. I like this impressive post as it have well description about the dofollow strategy.It is beneficial factor for every new blogger to convert his page into dofollow blog to fast promotion and strong relations who have strong influence on search engines tracking soft wares. Nice information, many thanks to the author. I agree with your thought.Thank you for your sharing. Great post! It’s very useful for me. So, putting the same anchor text and link from the body of the paragraph and footer will look spammy. for cutts said footers are for referals or source and some other links. When posting on a do follow blog, do both the blog owner and the person who comments receive quality back links for their postings, or do the comments solely benefit the owner of the blog? I was also wondering how commenting on a do follow blog compares with SEO article marketing. Thank you for the info! This is great site and i like to come back on this sites here all content are unique and I never see on another websites. keep it up admin. Wonderful post, you nicely described your topic. I am dying to write few words in favor of you and would like to say thanks for doing this excellent job. These facts are awesome and very informative to all. After the Google Panda and Google Penguin Update link building has become more tough to everyone. Their total intention is to avoid all spamming activities. So i suggest all to avoid these techniques. Commenting is the best way to increase interaction with the co-bloggers. informative post… Do-follow links always helpful for the website.